TicketsatWork.com is featuring an incredible ticket special for all of you tinkering with the calendar about a return trip to LEGOLAND® California, or for those families ready to organize their very first trip to the fun theme park in Southern California. 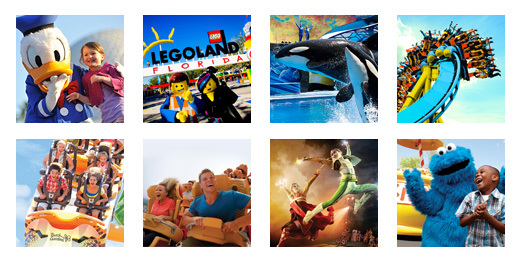 Right now you can save 25% for LEGOLAND California + get a 2nd Day Free! If you haven’t been for a while, or are just revving up for your inaugural visit, let us tell you that LEGOLAND® California has recently debuted some cool additions to the line-up – to go along with the exciting original attractions. Just last week was the grand opening of LEGO® NINJAGO® World, the newest land at LEGOLAND® California Resort. Get set to launch lightning, fireballs, ice and shock waves on NINJAGO® The Ride and explore the five attractions all designed to test guests’ balance, agility, speed and creativity: Zane’s Temple Build, Kai’s Spinners, Cole’s Rock Climb, Jay’s Lightning Drill and NINJAGO The Ride. NINJAGO World also includes 22 new LEGO models, a new retail outlet, Wu’s Warehouse and a dining option, Ninja Kitchen, where LEGOLAND chefs put a special twist on Asian street food with Banh Mi sandwiches on fresh baked baguettes or steamed Bao Buns with crispy pork belly, lemongrass chicken or baked sweet chili tofu. If that’s not awesome enough, there is also the Star Wars area of the theme park’s Miniland, which features a scale model of the Death Star, a 1,900-pound masterwork made with half a million plastic bricks. LEGOLAND® California guests can enjoy seven of the most famous scenes from the six live-action Star Wars movies, as well as a scene from the animated series Star Wars: The Clone Wars™ all made out of 1.5 million LEGO® bricks built in 1:20 scale. Plus! Guests can explore attractions like Fun Town, Land of Adventure, Castle Hill, and Imagination Zone – among many others. A day at LEGOLAND® California equals fun and excitement for the whole family. With 60-plus rides, attractions and shows available, LEGOLAND® California offers a ton of options to enjoy. LEGOLAND® California Resort also offers two water parks for endless aquatics play and the SEA LIFE Aquarium. The awesome LEGOLAND Hotel features 250 rooms and is packed with a variety of LEGO features for the kids. Now is a great time to grab our special: save 25% for Legoland California + get a 2nd Day Free! The Resort Hopper + 2nd Day Free E-Ticket package is valid for same-day admission to LEGOLAND® California, SEA LIFE Aquarium and LEGOLAND Water Park + a 2nd day free through the end of the year.